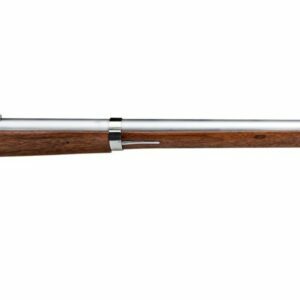 It was considered the apex European military gun of that time, introduced by the British War Department after several studies to improve the calibers and the dimensions of the previous models. Taking into consideration the need to equip other corps or regiments other than the infantry with a rifle also led to the “Short Rifle” models. 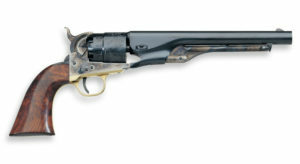 At the beginning the P1853 was simply shortened, but within few years the guns did not suit some different military requirements and it was then replaced by the P1858 Short Rifle model. The barrel is retained by two steel bands, equipped with a ladder type straight rear sight with a slider. Except for the steel bands, the garnitures are made of brass. The ramrod tip is shaped with the characteristic jag slot.The barrel is blued and lock case hardened. The gun is equipped with two sling swivels, one fitted under the front band and the other one fitted in front of the trigger guard. The stock is made of walnut. Made by Davide Pedersoli & C.
Copyright © 2019 Must Puru. Powered by WordPress. Theme: Spacious by ThemeGrill.